In high school I was an avid reader of Ernest Hemingway, whose novel The Sun Also Rises and nonfiction book Death in the Afternoon describe the Spanish bullfight, but I never actually saw a bullfight when I did a study abroad program in Madrid in high school. Many years later in Barcelona I saw a demonstration calling for a ban on bullfighting because of its cruelty to animals. The stadium in Vila Franca de Xira was built more than a hundred years ago. 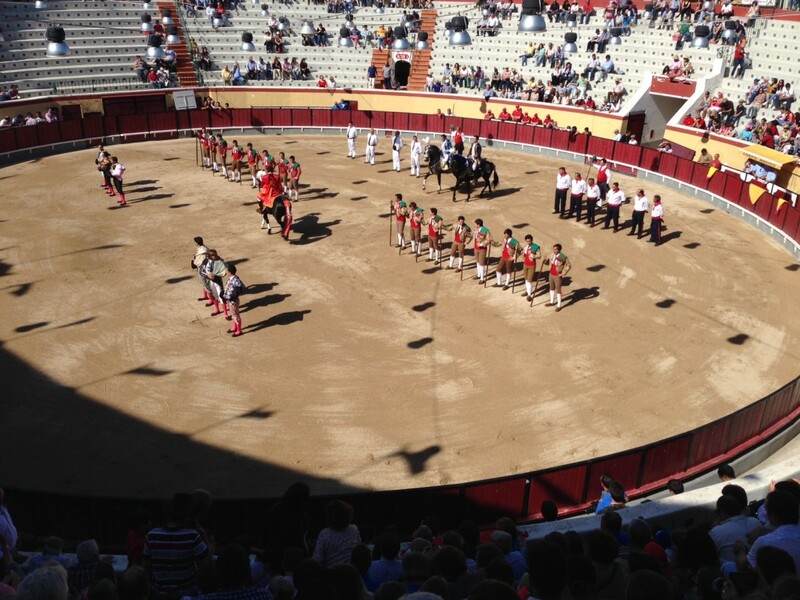 Like their neighbors on the Iberian Peninsula, many Portuguese enjoy watching bullfights. Among them is our old friend Luis Capucha, who grew up and still lives in one of the country’s most avid bullfighting towns, Vila Franca de Xira. V.F. Xira is part of the Ribatejo, an agricultural region north and west of Lisbon known for raising cattle, and while now considered a suburb of Lisbon, it’s a town with a long and illustrious history — not only for bullfighting but also for resistance to the 48-year-long fascist dictatorship. Bullfighting and left-wing political activism may make strange bedfellows, as participants in the Barcelona demonstration may attest. 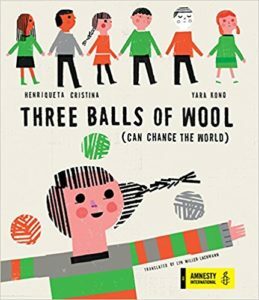 But both are rooted in the history of this region in Portugal and speak to a tradition of community solidarity. The introduction of the two bullfighting teams is accompanied by music and fanfare. In years past, prominent fado singers performed at bullfights. That said, the first of the six animals that I saw did not seem to understand why he was there, proving, I suppose, that some bulls are smarter than others and/or show more fight.] But in all cases men on horses spear the bull with sharp brightly-colored lances to rile him up and motivate him to charge the brightly-clothed young fighters. And in the end, the creature ends up in the same slaughterhouse as his non-fighting herdmates. The first bull, the largest one at 545 kilos, seemed confused the entire time and turned out a rather passive opponent. The second difference is that in Spain, bullfighting is primarily an individual display, where the matador provokes, evades, tires, and finally kills the bull. 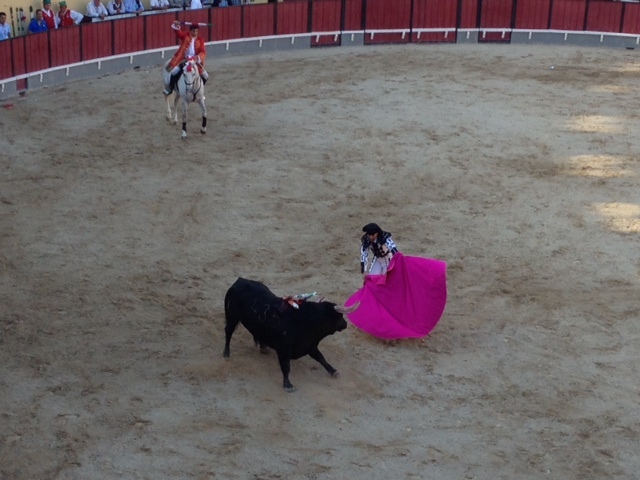 In the bullfight that I saw in V.F. Xira, it was a team event [Luís pointed out that it isn’t considered a sport in Portugal and Spain in that competition among humans isn’t the principal purpose, but rather the confrontation of man and beast]. First the horsemen pierced the bull. 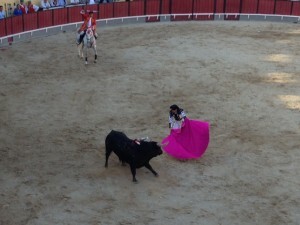 Then the lead bullfighter used the cape to engage him in the elaborate “dance,” the common image of the bullfight. Finally, the lead bullfighter induced the bull to charge, grabbed him by the horns, and held his head while the rest of the bullfighting team wrestled the creature to a standstill. Victory came when another member of the team grabbed the “broken” bovine’s tail and followed him around the ring. There were two teams and six bulls, and each team fought and wrestled three bulls, with the winner — the team with the best form and teamwork — announced at the end. And teamwork, the ability of the young men to work together, was key. The fight that we saw was no contest. The local young men from V.F. Xira bested a team from near Setúbal so hapless that they needed seven tries to wrestle a feisty Bull #2. Bullfighters with capes tire out the bull and maneuver him around the ring for the wrestling finale. The bull’s horns are shaved down primarily to protect the horses. Luis explained that most of his colleagues at the university, and most people in general, don’t like bullfighting and/or don’t understand it. 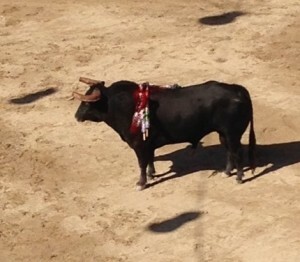 He, in turn, is a bullfighting fanatic. 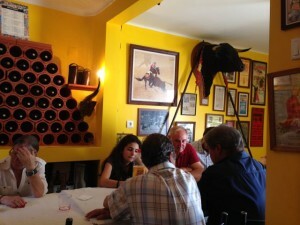 The fans of the sport meet in clubs called tertúlias, scattered around the town, where they enjoy food, drink, conversation, and videos of classic bullfights. One of the more amusing videos was a Portuguese riff on the reality show “Jackass” where often-drunk locals and tourists tangled with bulls let loose in the streets. (Pamplona, Spain is hardly the only place where this happens. 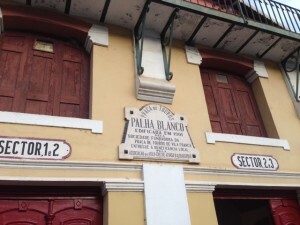 Other communities in Spain and Portugal, southern France, South America, and even India host a running of the bulls.) Occasionally, the tertúlia TV is turned to a soccer match, but this is a rarity. In Vila Franca de Xira, bullfighting is king. Every tertúlia has its own bull head, among the photos of famous fighters and events. The bullfighters were all young men in their late teens and twenties. One from the visiting team announced before the sixth heat that his father — a former bullfighter — sat in the audience. The father who stepped up to embrace his son looked no older than 50. Watching these brightly clad young men grab the bull by his horns and pile on to stop him, I visualized bored teenagers in dirty work clothes standing in the fields, calling “touro, touro, touro” and daring animals that weighed more than half a ton to run at them. 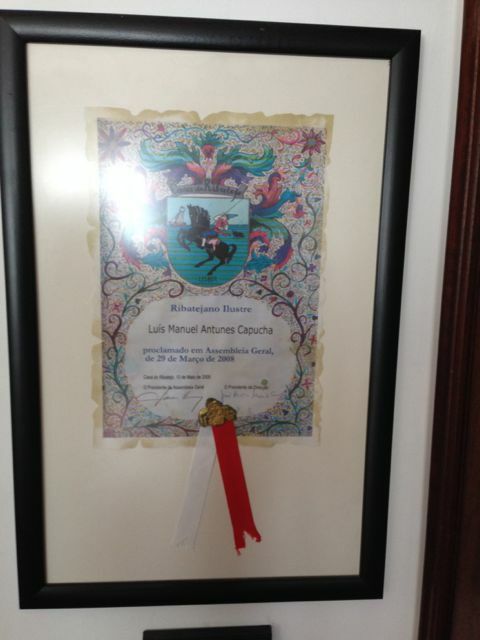 Luis’s honor for his community involvement. I’ve lived all my life in cities and suburbs, but friends who’ve grown up on farms describe “cow tipping,” several kids waiting for a cow to fall asleep on all four legs and then running up to her and knocking her over. It’s not a nice way to treat an animal, but it’s how kids entertained themselves when there wasn’t much else to do. Taunting bulls in the fields added a whole lot of danger, and I imagine that is how the sport of bullfighting came into being — a collective and competitive pastime rooted in the economy and history of a region where people didn’t have many resources except each other and the natural world around them. Thanks, Lyn, for this window into bull fighting. I’d also read Hemingway. He described the running with the bulls ritual also. I never understood bull fighting. I doubt that I would be tempted to see an exhibition. But I didn’t grow up in that culture. I would probably think differently had I grown up there. It really is part of the culture for the people who grow up there, and the young people are just as dedicated as their elders. I would have expected 14-year-old Frederico to name soccer as his favorite sport to watch, and while he is a huge Benfica fan, he likes bullfighting even more.